NOTE: Updated October 10th with updates in bold. Originally published March 31st, 2014. California’s historic drought and shrinking water supplies are putting a spotlight on hydraulic fracturing or “fracking” and its thirst for freshwater. In other states, the controversial technique is a heavy water consumer, using millions of gallons of freshwater to extract oil or gas from each well. In California, fracking uses less water on average than in other states, according to industry data. But that trend is shifting, as oil companies make a play for the Monterey Shale, though to be the largest untapped oil resource in the country. The southern San Joaquin Valley is the site of rising tensions between farming and fracking, as the two industries are increasingly coming into contact. While farmers fallow land and pull up orchards, they’re asking whether there’s enough water to go around. 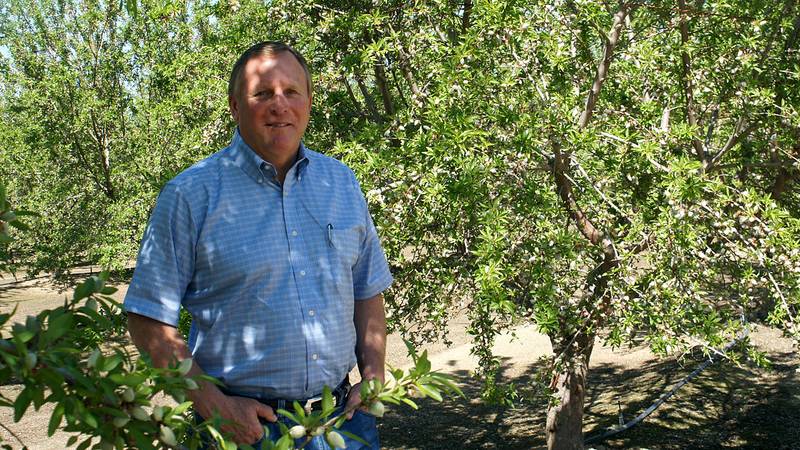 “We’re just coming off the bloom period and the bees are leaving the orchard,” says farmer Keith Gardiner, walking through rows of almond trees near Wasco, a small town north of Bakersfield. Bring up the state’s drought and Gardiner reacts the way a lot of farmers do – with a frown and a shake of the head. 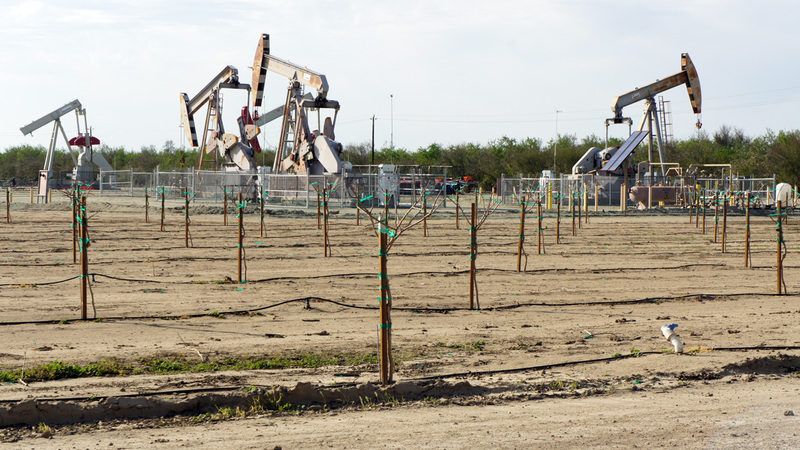 It’s easy to spot what’s adding to Gardiner’s concerns: oil wells are sprinkled throughout the orchards here. Pump jacks slowly bob into sight above the treetops. The new interest is due to the Monterey Shale, a layer of rock about two miles under the surface. Twenty-five oil wells have been fracked in this 10-square-mile area. Water is injected into the well at high pressure, along with sand and chemicals. The process creates tiny cracks in the rock, freeing up the oil. Fracking generally takes a few weeks, after which the oil well produces for several years. This technology has fueled expansive oil and gas booms in other states. In Pennsylvania, it’s been for natural gas. In North Dakota and Texas, it’s been for oil. In those fields, fracking uses several million gallons of water for each oil well. California hasn’t seen the same boom – at least, not yet. Depending on your point of view, the rock Miner is holding is either California’s biggest energy opportunity or its biggest environmental threat. Miner says oil companies are experimenting with how to use fracking to access it, given California’s complex geology. Fracking is nothing new in California. It’s been used for decades in some of the oldest oil fields near Bakersfield. But as interest in the less-developed Monterey Shale has grown, so have concerns over water contamination and water use. In March, protesters in Sacramento called for a moratorium on fracking. “Governor Brown, California doesn’t want our water depleted from fracking or any hydraulic drilling methods,” said Latrice Carter of Carson, California, speaking to the crowd. The city of Carson recently approved a 45-day moratorium on oil drilling, amid fears around fracking. “In California today, hydraulic fracturing uses very small amounts of water,” says Tupper Hull of the Western States Petroleum Association, an oil industry group. He points out that all together, fracking operations across the state used 105 million gallons of water last year. That’s the same amount of water that 650 homes use in a year. While oil fields in Texas use an average of 1-to-4 million gallons per well, an average frack job in California uses 134,000 gallons of water, according to a report from Ceres, a sustainability think tank. 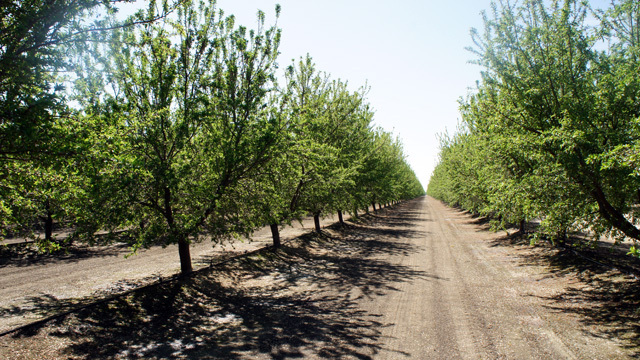 One acre of almond trees uses six times that amount annually. As the Monterey Shale is explored, fracking operations could require more water. In the Rose oil field near Wasco, fracking uses from half a million to a million gallons of water per well, substantially more than other oil fields. The difference has to do with how the wells are drilled. In older fields, wells are drilled directly down. 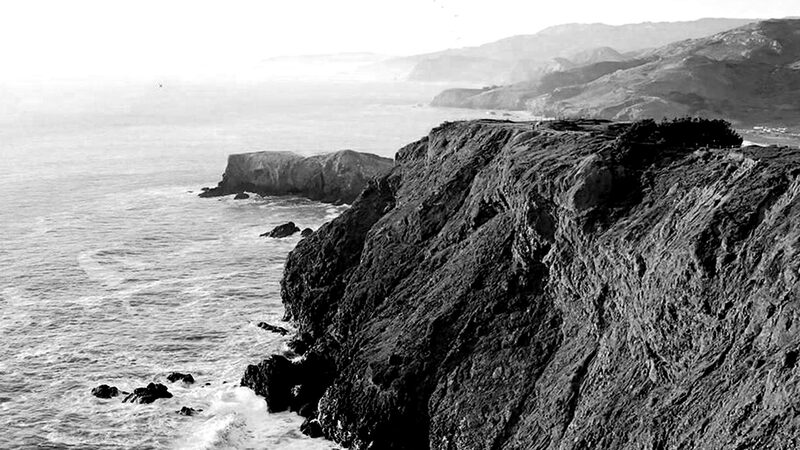 In parts of the Monterey Shale, the well makes a sharp horizontal turn, extending as far as a mile along the layer of rock. 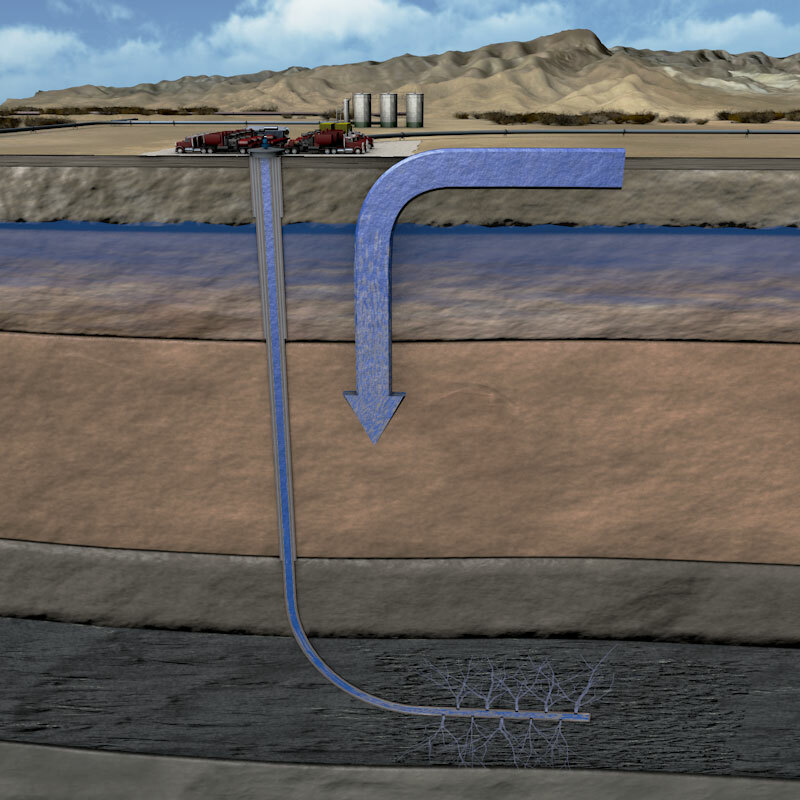 Horizontal drilling has become common in other oil and gas formations where fracking is used. According to permits filed for the first time this year under new state regulations, oil companies are planning about 250 new fracking jobs as of March that would draw water mostly from local water districts. Under new rules, California oil companies must alert the state prior to fracking, disclosing the water volume and water source. The data above represents about 250 fracking jobs planned as of March 2014. Overall, the water use is the same as the annual demand of 260 homes. Most of the districts, like the Belridge Water Storage District and the West Kern Water District, rely on water from the State Water Project, which is fed through the highly-stressed Sacramento-San Joaquin Delta. With the lack of rainfall, state officials have warned districts that little to no water will come from the project this year. A spokesperson for Aera Energy says the company has banked enough water to meet its needs this year. A representative for Chevron says one of their suppliers has imposed water restrictions, but it hasn't significantly affected their operations. “I know there’s a big push to try to figure out how to use some less desirable water that we can’t really farm with,” he adds. While tensions have been high around Wasco, other parts of the farming community want to see fracking and farming coexist. Supporters say expanding fracking would bring jobs to parts of the state with serious unemployment. According to a study from the University of Southern California, developing the Monterey Shale could produce up to $24 billion in tax revenue and as many as 2.8 million jobs by the end of the decade, though some of those jobs would be temporary. It could also reverse California’s shrinking oil production, which has been on the decline since the mid-1980s. The amounts of water used by the oil industry are still a tiny fraction of what’s used by California agriculture. But some fear there will be a localized impact from fracking, because it happens in some of the most water-stressed parts of the state. “If we combine the fracking and the drought question together, it’s just making a bad situation worse,” says Jay Famiglietti, a hydrologist and professor at UC Irvine. Groundwater in the southern San Joaquin Valley has been dramatically over-pumped in the last 50 years, a trend that gets worse during drought years like this one. That pressure comes largely from agriculture, says Famiglietti, but he believes fracking doesn’t help. Fracking traditionally uses freshwater instead of salty or briny water. Oil companies generally have easy access to briny water, since it’s produced from the rock formation along with the oil. It generally hasn’t been used for fracking, because the salts could react with chemicals in the fracking fluids, which are added to suspend sand particles in the solution. But increasingly in other parts of the country, oil and gas companies are using recycled water to reduce their freshwater demand. “It’s that need for freshwater that had people asking: how do we do this without freshwater?” says Walter Dale, strategic business manager for water solutions for Halliburton. The company runs fracking operations for several oil and gas companies around the country. Halliburton has started offering its technology last year, known as H20 Forward. Some companies also treat water from their operations, so it’s fresh enough to use in fracking again. Dale says he's had conversations with some California oil companies, though it’s in early stages. “California actually has the opportunity to look at the lessons learned in the last 4-to-5 years in the industry and implement some of those technologies to begin their field development,” he says. Some fracking operations in California are already using recycled water, though most use freshwater, according to permits filed with state regulators. One oil company, Occidental, says it plans to use recycled water in a handful of fracking wells this year. Representatives from Chevron and Aera Energy say the companies are investigating ways to reduce their reliance on freshwater.